Italian Chocolate Cake. Call Me By Your Name. If we've had a conversation in the past couple of months, there's a good chance I've spent a chunk of it telling you to read Call Me By Your Name. I read it in November in a single sitting, my back against the radiator in an Edinburgh kitchen, jumping up every now and then to attend to a conveyer belt of cakes going into and out of the oven. I emerged from the book somewhere near 4am, as I placed the final cake onto a cooling rack. A love story set on the Italian Riviera in the 1980s, it is so evocative, of Italy, and of summer, that I realised I had spent the night transported, leaving the icy flat behind. Reading it made me want to be a better, bolder, and braver person. It's rare to walk away from a book feeling genuinely changed, but I was by this one. My mum's house, where I am this week, has a rosemary tree in the front garden. A tree, not a bush - it has spent nearly two decades sending its roots deep, and spreading out across the rest of the plants. She gives great handfuls of it to people who drop by to visit, but can never get rid of it fast enough. Along with the smell of hot bitumen melting on the roads, the late afternoon rain, and a Bunnings sausage sizzle on a Saturday, Australia smells to me like the rosemary that hits my nose when I open the gate, and walk down the steps to the other place I call home. We use it in as many dishes as possible, and it it is a welcome presence in the cake I make most often - the Winnie-the-Pooh inspired cakes that are in my book. I wanted to included it here - a scent of summer in Call Me By Your Name, and here in Brisbane. In summer, I generally have to be persuaded to eat dessert - rejecting anything heavier than a scoop of gelato, or a single, ripe peach. But this cake is special. 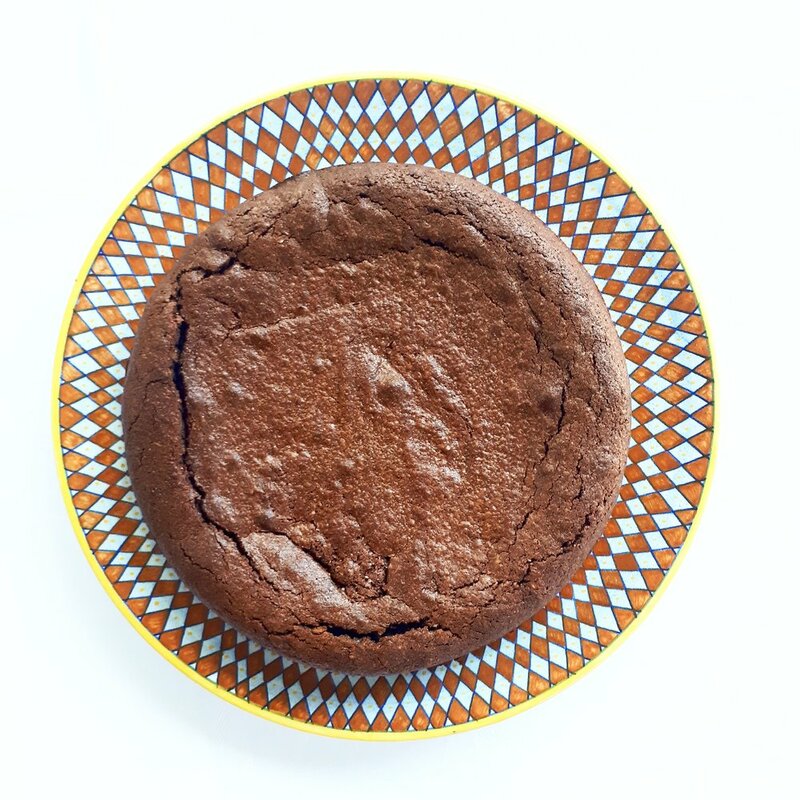 It is a chocolate cake suitable for a summer day - not at all cloying or too heavy. 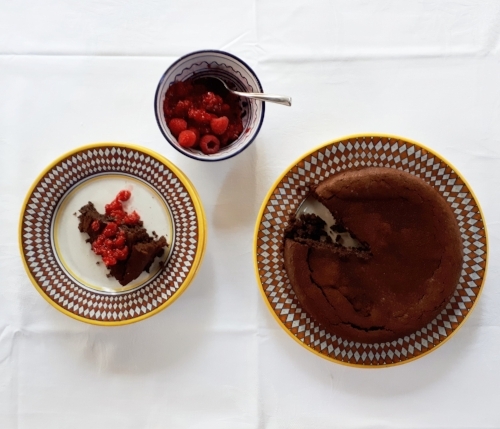 It is undeniably rich, but with a bit of sharp fruit (the raspberries suggested in the book are perfect), it is more than appropriate for a balmy afternoon. If you're currently in the Northern Hemisphere, in deepest, coldest January, it would be lovely with some poached rhubarb, or roasted pears. 1. Preheat the oven to 160C (180 fan). Grease and line the tin, doing so thoroughly as the cake is delicate and will be tricky to get out of the tin if it sticks. Melt the butter in the heatproof bowl over a pan of simmering water. Chop the chocolate into small chunks, and add to the bowl, stirring until the chocolate has melted. Add the olive oil, stir, and set aside. 2. Separate the eggs. and whisk the yolks and sugar together in the mixing bowl until pale. Whisk in the butter, chocolate, and oil. 3. Blitz the hazelnuts finely, in batches, adding the leaves from the rosemary to the final batch. If you are using ground hazelnuts, chop the rosemary as finely as you can. Fold the ground hazelnuts and the rosemary into the cake batter. 4. Beat the egg whites to stiff peaks. Fold a third into the cake batter to loosen it, then fold the rest in very gently. Tip into the lined cake tin. 5. Bake for 45 minutes, until a skewer inserted into the cake comes out clean. Leave to cool and settle in the tin for at least twenty minutes. Dust with cocoa and serve warm or at room temperature. Treacle Tart with Rosemary and Sea Salt Ice-Cream. Harry Potter and the Philosopher's Stone. It will come as no surprise to anyone who has spent more than a couple of minutes in my company (or has read some of this blog) that I loved the annual return to school. Covering my books with sticky plastic, buying new pens and pencils, flicking through the crisp white pages of my textbooks and notebooks, selecting a couple of special items - a new pencil case/notebook/folder. The idea of starting fresh is one I relish. By the time I hit November each year, my textbooks were spotted with tea, notebooks had become progressively messier towards the back, and all my best pens had been nicked. But the start of the school year was full of promise. Despite all of this back-to-school joy happening in January in Australia, I have still awoken on 01 September every year thinking (hoping?) I'm late for my train from Platform 9 and 3/4. As soon as I moved to London, I embraced September as the 'true' start of the school year - the coming of the autumn and the cooler evenings fit well with the imagined childhood I had at Hogwarts. And so, as September approached this year, I couldn't imagine a better supper club to host than one where I recreated Harry's first evening at Hogwarts. ‘Starving,’ said Harry, taking a large bite out of a pumpkin pasty. He had never seen so many things he liked to eat on one table: roast beef, roast chicken, pork chops and lamb chops sausages, bacon and steak, boiled potatoes, roast potatoes, chips, Yorkshire pudding, peas, carrots, gravy, ketchup and, for some strange reason, mint humbugs. This treacle tart was the very first recipe I posted on the blog, some 18 months ago. I stand by the original recipe - it's simple and delicious and is just as good without the lattice on top (why faff unnecessarily?). The additional detail in the line before: the many varied ice-cream flavours gave me license to think up something new. This sweet/savoury ice-cream is just glorious, and cuts through the cloying sweetness of the golden syrup. 1. Place the milk and cream in the saucepan. Bring almost to the boil over a low heat. Meanwhile, whisk the egg yolks with the golden caster sugar until light and creamy. 2. Once the milk and cream are just under boiling point, pour it over the yolks, whisking constantly so that the yolks don't cook. Wash out the saucepan, then pour the custard into it. Add the rosemary and cook while stirring over a very low heat until it coats the back of a wooden spoon. If you're worried about it splitting, keep a sink full of cold water at the ready, and plunge the pan in to cool down if you think the mixture might be curdling. I find that keeping the heat low and stirring continuously works well in preventing this. 3. Once the custard is thick, add the salt, then strain it into a large bowl to remove the rosemary. Press a layer of cling film onto the surface of it (which prevents it forming a skin) and allow to cool completely. 4. Once cooled, pour the custard into the ice-cream maker and freeze according to the machine instructions. Alternatively, pour into a freezer-proof container and freeze for two hours. Once partially set, remove from freezer, beat until smooth with the hand whisk and return to the freezer for another hour. Repeat for three hours and then freeze overnight. Serve with treacle tart. Or with a honey cake. Or on its own, with a spoon. I served this ice-cream on some finely blitzed rosemary and sea salt praline. To make this, melt 150g sugar in 30ml water in a small saucepan, then boil until the mixture turns a deep golden. While the caramel is cooking, put some a large pinch of sea salt and a couple of sprigs of rosemary needles onto a sheet of greaseproof paper, then pour the caramel over the top once it's ready. Allow to cool and harden, then blitz to a fine powder in a food processor.